BS Contact Stereo 7.2 supports different stereo rendering modes. Stereo (also often referred to as "3D") requires presenting separate images with the right perspective for the left and right eye. Some types of Multiview autosteroscopic displays are requiring even more views. Red-Blue stereo can be activated in BS Contact VRML/X3D's right mouse menu Settings > Stereo > Red-Blue. This requires a professional Graphics card with hardware OpenGL Stereo Support (i.e. NVidia Quadro, 3D Labs, ATI-Fire GL, NVStereo Driver). In the driver's control panel opengl settings OpenGL stereo support must be enabled. 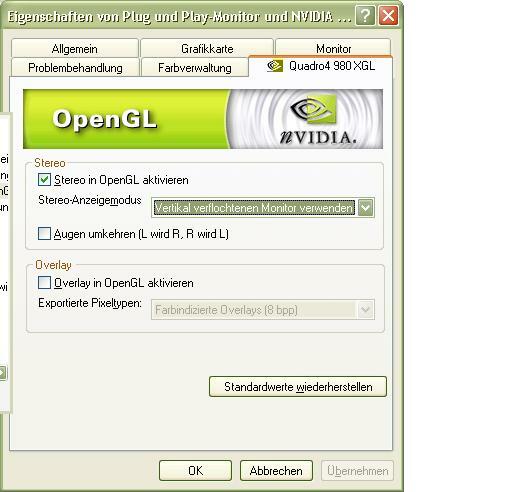 Here is an example configuration dialog for an Nvidia Quadro XGL card (in German). 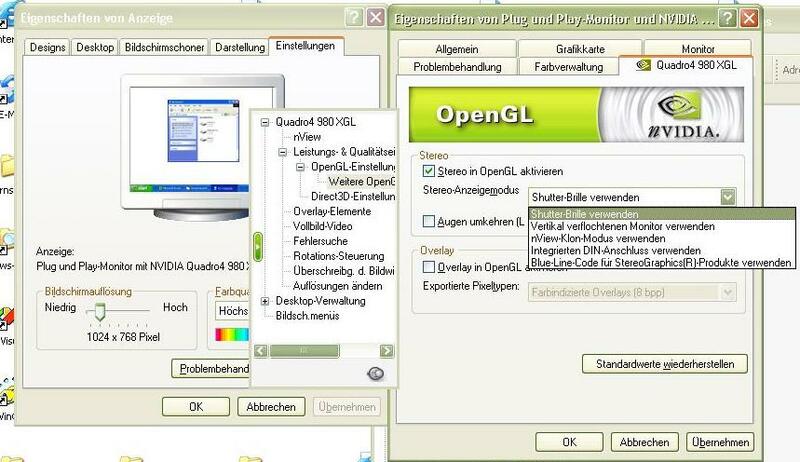 In the Contact preferences the OpenGL driver must be selected, in the Contact OpenGL Settings dialog "Stereo" must be enabled in order to search for an stereo capable display format. The player must be restarted if this option is changed, and now the option Settings ->Stereo -> Hardware is available. If a stereo Open GL format is initialized Contact renders two times for the left and right buffer. In the Settings->Stereo -> Hardware (Quad Buffered) Menu must be enabled. This is automatically enabled If a stereo GL format is found and initialized at the next start. This method displays the scene in the same frame with Red for the left eye, blue for the right. It requires RED-BLUE glasses. It works best with objects displayed in wire frame. This method displays the scene two times with split viewports. The viewing setup requires a dual output graphics cards, 2 stacked projectors with polarization filters and polarization glasses. The driver (e.g. NVidia NView need to configured to provide one continuous desktop over the two monitor outputs). Contact in full screen mode then covers both displays. This modes work with the Contact OpenGL and DirectX9 renderes. It is important to properly configure the NVidia NView driver to an horizonal span mode. It will not work with 2 graphics outputs configured as separate displays or clone mode. This method is intended to use with the SpatialView 5 View multiview stereoscopic displays. 5 Views are interleaved in one output image. It requires multitexturing support in OpenGL or DirectX9. Stereo separation can be changed with the Stereo Options dialog box (F6). This method is intended to use with the techXpert multiview autostereoscopic displays. It requires multitexturing support in OpenGL or DirectX9. Stereo separation can be changed with the Stereo Options dialog box (F6). This method is intended to use with the Opticality auto stereoscopic displays. Depending on the type of the installed display up to 8 images are interleaved in one output image. It requires the BS Contact Stereo to run in the OpenGL mode and multitexturing support in OpenGL. The X3D Display Manger need to be installed. Stereo separation can be changed with the Stereo Options dialog box (F6). This mode will not work if the X3D Display Manager software is not properly installed and working, here is an example screen shot of the interleaved 3D image. 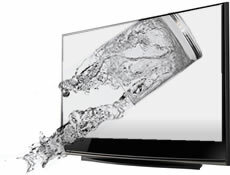 This method is intended to use with Philips 3D TV's. It requires OpenGL driver and outputs an image with a depth image in side by side format. The depth range must be manualy optimized using a good Viewpoint and NavigationInfo setting. The window must be maximized, so that the Displays switches to 3D mode. 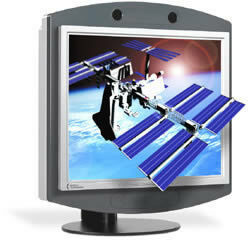 This method is intended to use with the SeeReal auto stereoscopic LCD Monitor. The two images are interleaved vertically in one output image. It requires the Contact Open GL Driver and stencil buffer support. The screen resolution must match the physical resolution of the monitor. The SeeReal display can also be driven by using the Contact Open GL Hardware Stereo mode, and setting the "vertical interlaced monitor" stereo format in the Display Settings of the graphics Driver (e.g. Nvidia Quadro ). This method is intended to use with the LG M4210D-B21 - 42" class LCD Widescreen Full HD Monitor with 3D multiview autostereoscopic display. This method is intended to use with the 3D DLP HDTVs displays. This method is intended to use with the Alioscopy multiview autostereoscopic displays. This method is intended to use with iZ3D Monitor. It requires DirectX driver and outputs an image with a depth image in side by side format. The window must be maximized over both screen, so that the Displays switches to 3D mode. Experimental flipping between left and right frame at a given interval over time. Vertical or horizontal colum or row interleaving. bit mask for enabling/disabling specific drawing pathes, -1 uses all pathes, 1 would only render the first view. The ViewVolume node (see SDK) can be used to specify the projection parameters in more detail, compared to the Viewpoint node. BS Contact supports stereo images. Content authors have the choice of using either the side-by-side JPEG stereo image format (.jps file extension) within a standard ImageTexture node or the StereoTexture node, specifying separate left and right ImageTextures in the texture field. For viewing stereo images directly the stereoSeparation should be set to 0. The texture field contains one or more Texture Nodes. ie. ImageTexture, PixelTexture or MovieTexture. The type field indicated the type of stereoImage. The StereoMovieTexture node allows to use Stereo Movies availabe as separate files for the left and right eye or as side-by-side. The node is optimized for DirectX9 using a custom DirectShow Renderer. For best performance MPEG2 encoded material in side-by-side (SPLIT-HORIZONTAL) or above-below (SPLIT-VERTICAL) format is recommended. When using the Contact OpenGL driver stereo videos in 1 stream (e.g.Side-by-Side ) can be displayed using the StereoTexture node. The stereoSeparation is set to 0, because the video already contains separate views. StereoMovieTexture supports capturing from Direct Show camera devices. The capture device can be configured in the Stereo Control Pad. Two exact equals cameras are required. The stand-alone BSContact.exe can load Side-By-Side, Left-Right and JPS files directly and a 3D scene is generated automatically to view the stereo image or movie including panning and zooming functionality. An stereo image can be opened via the menuFile->Open Stereo Image. The following suffix at the file name are recognized. _L. _R. _Left. _Right. LEFT-RIGHT format is assumed. jps, pns bms are JPG, PNG, BMP files in side by side format. Once an image has been loaded the Page-Up, Page-Down keys can be used. The node TiledImageTextures allows the use of high-resolution image material. To improve qualtiy Mip-Mapping and Anti-Aliasing might be enabled in the Contact settings. To allow the loading of large images with the ImageTexture node the setting Performance - max texture size should be increased e.g. to 2048 or 4096 if the graphics card can handle these sizes properly. � 2003 - 2013 Bitmanagement Software - All rights reserved.